In the book, "The Millionaire Next Door" author Thomas Stanley writes that many of America's rich didn't inherit their wealth. Instead, they built their millions through hard work, diligent saving and living below their means. In other words, being cheap helps! Found this Mercedes Benz C300 parked out front of the Goodwill Store. The owner just left the thrift shop after I took this photo. She had a small Goodwill shopping bag in her hand which she tossed in the trunk of her $50,000 Benz. Kind of makes you wonder what she had in the bag? Here we have a beautiful red Merceds Benz BLK-320 parked out front of the local thrift shop. A mom and her daughter jumped out of this sporty $30k Benz to see what thrifty deals they could score inside. 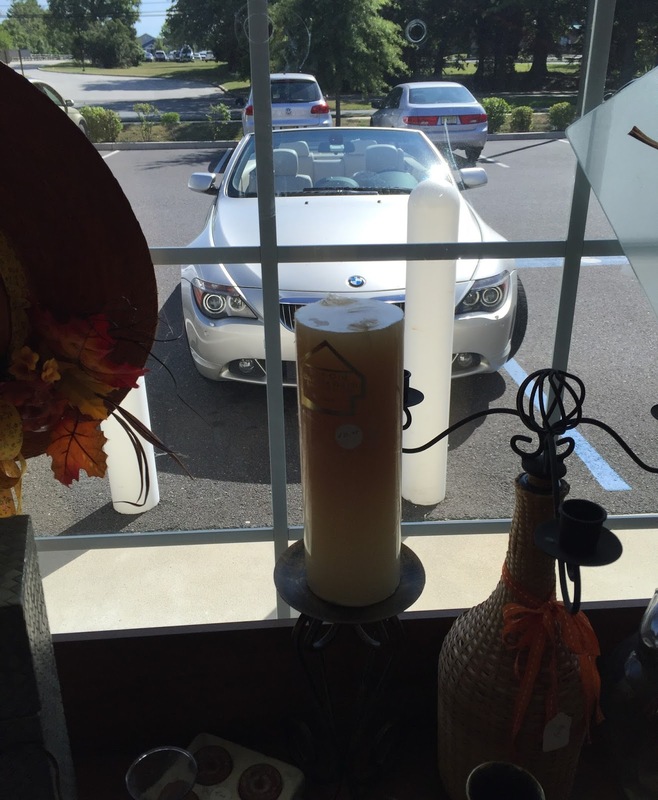 The owner of this brand new $60k BMW convertible stopped in the local St Vincent thrift shop to check out the men's clothing. He was dressed for the country club, wearing sporty khaki slacks and a crisp white tennis shirt. As he left the store, the cashier and asked him why he hadn't found any shirts to buy today? 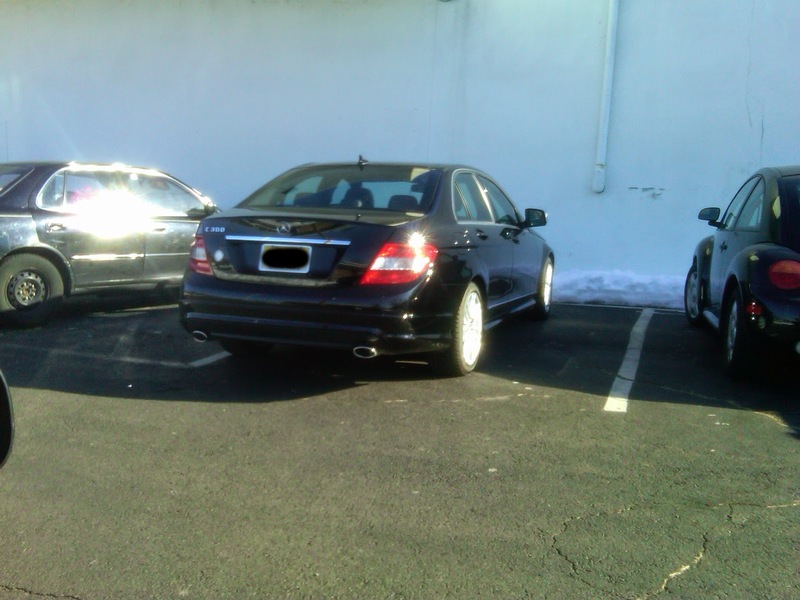 Obviously a regular customer and a man in a big hurry... look at that lousy park job! 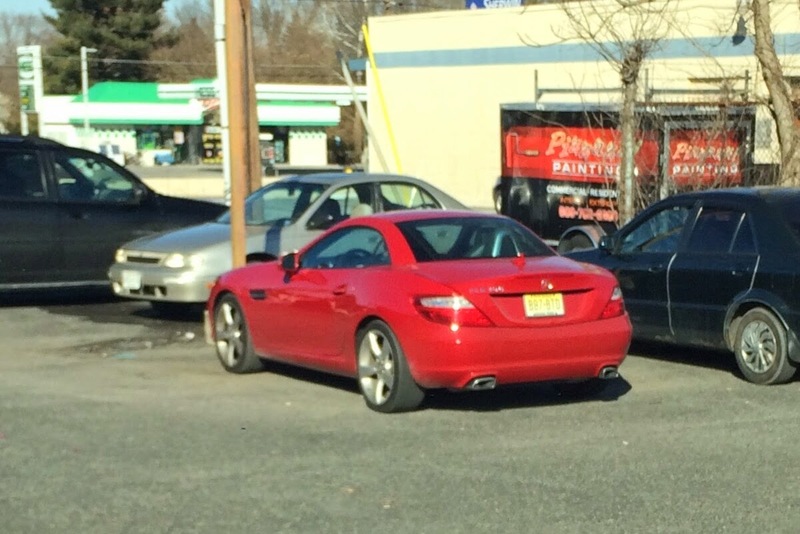 Here's a sporty little Mercedes Benz SLK350 parked at Goodwill. 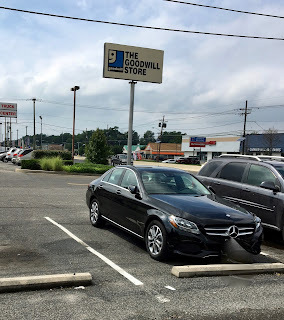 Not the first time, and won't be the last, that I'll see a Benz parked at the thrift store. 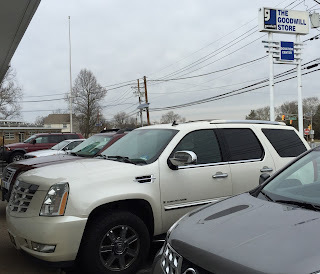 Take a look at this beast...a big, beautiful Cadillac Escalade parked right at the front door of Goodwill. Proof that it's not just the "Po" folks who go thrifting! 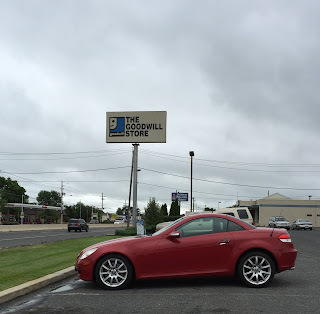 The driver of this Mercedes-Benz CLK 200 Coupe was waiting for his wife to come out of the Goodwill Store when I snapped this pix. My guess is her thrifty shopping habits freed up enough dinero for him to afford this $40,000 sports car. If so, nice going buddy! 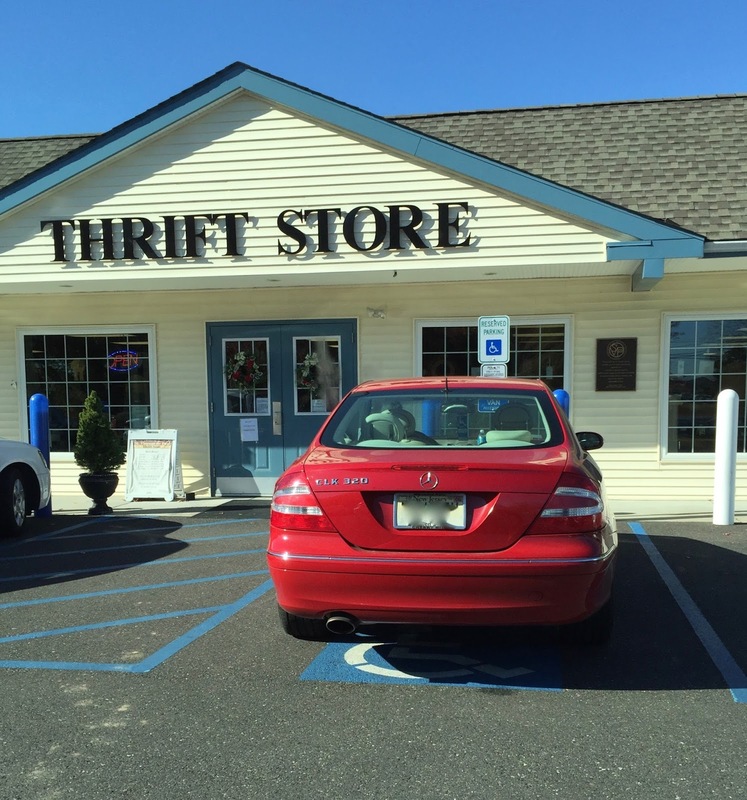 Here we have a beautiful Jaguar sedan parked in front of one of my local thrift shops. The older gentleman who stepped out of this high-end British car went right to the men's dress coats. Since he drives a JAG, I hope he found a British top coat in the racks! 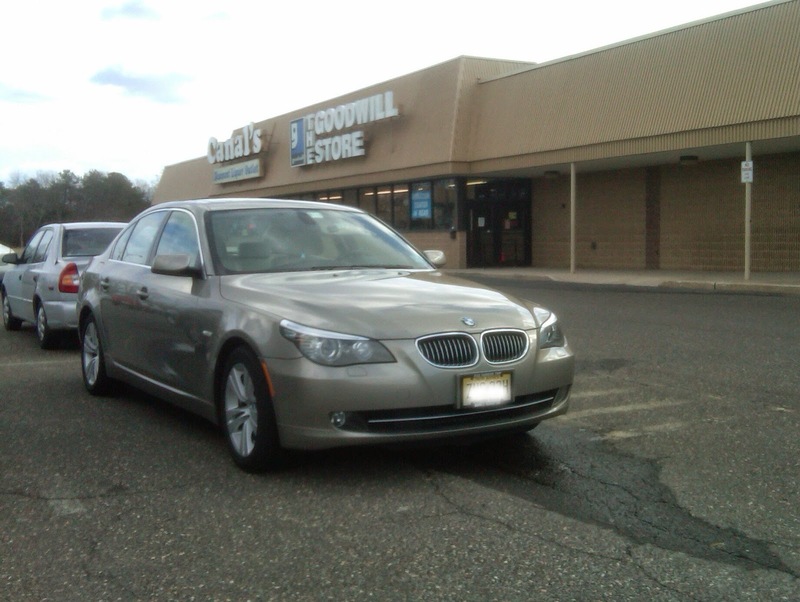 Here's a sweet BMW 328i parked at a Goodwill store. When you're paying only $1.99 for your shirts, you can afford to buy a $35, 000 Beemer! 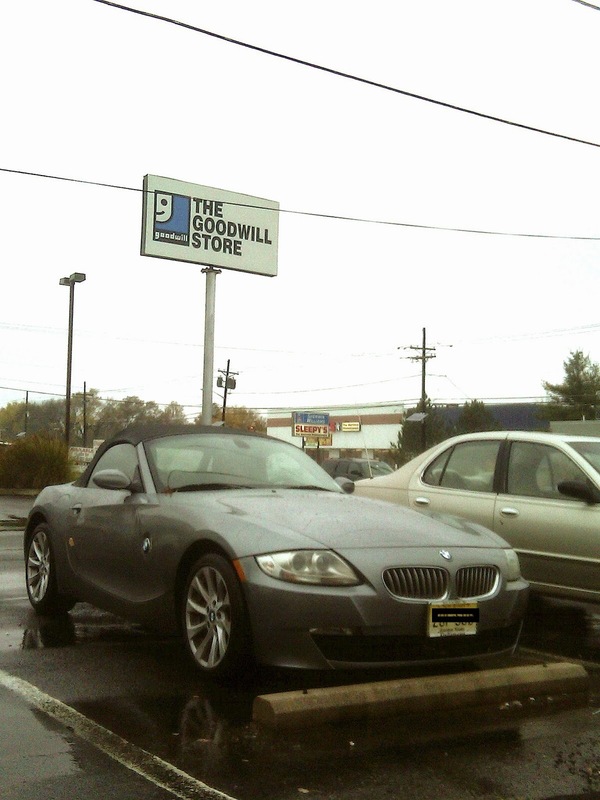 My jaw pretty much dropped when I spotted this beautiful BMW Z4 Roadster Convertible in the Goodwill parking lot! Brand new, this bad boy will set you back $35 to $40 thousand dollars. Yowza! 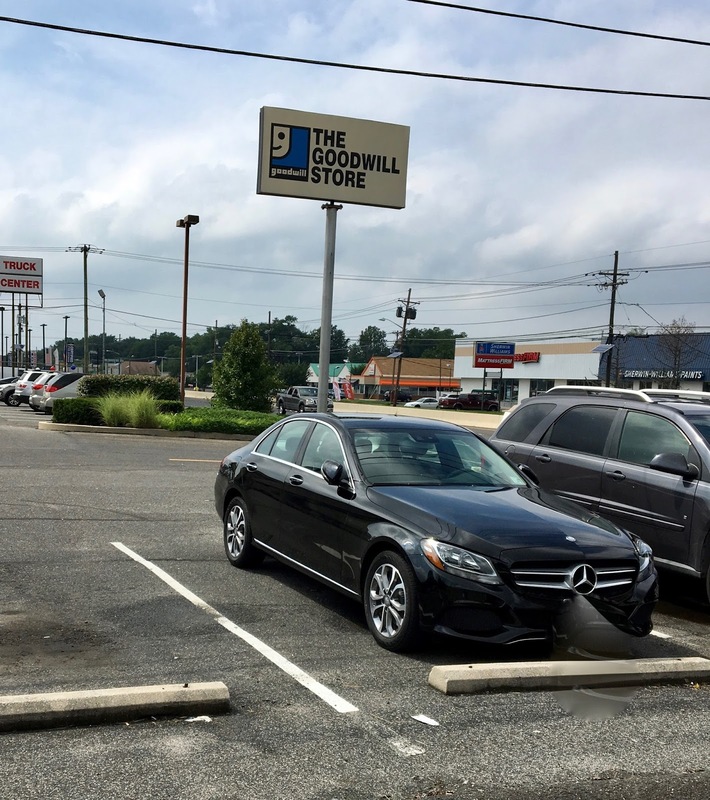 This is a Mercedes-Benz 300 E-Class Series parked at Goodwill. There's an Eighties era song called, "Mercedes Boy" sung by Pebbles. She sings, "If you want to ride in my Mercedes boy, tell ya what I am going to do." Obviously, the answer....go to the thrift store! Here's a "bad-to-the-bone" Ford Mustang. 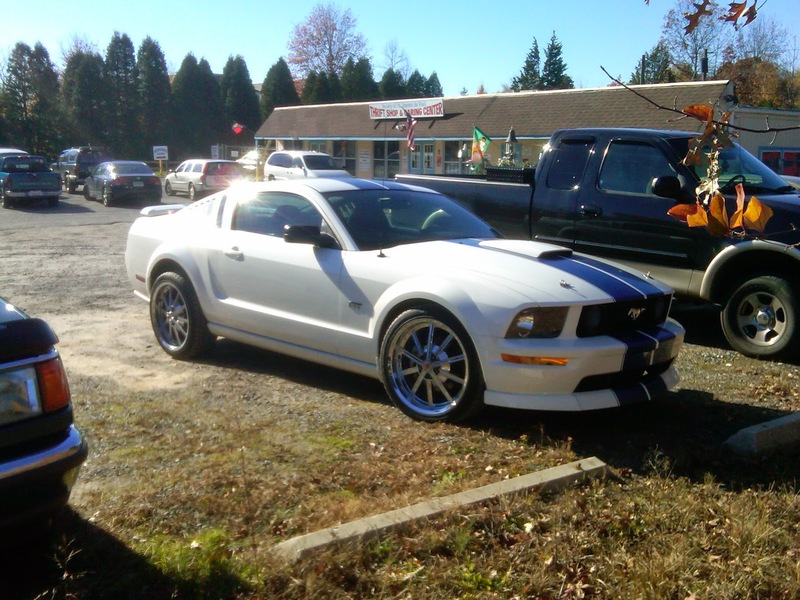 The owner was inside thrifting while I admired their Pony car outside. Wouldn't mind buying one, but at $25 gs, I'd have to kick up the eBay selling big time! A Mustang not your thrifting style? 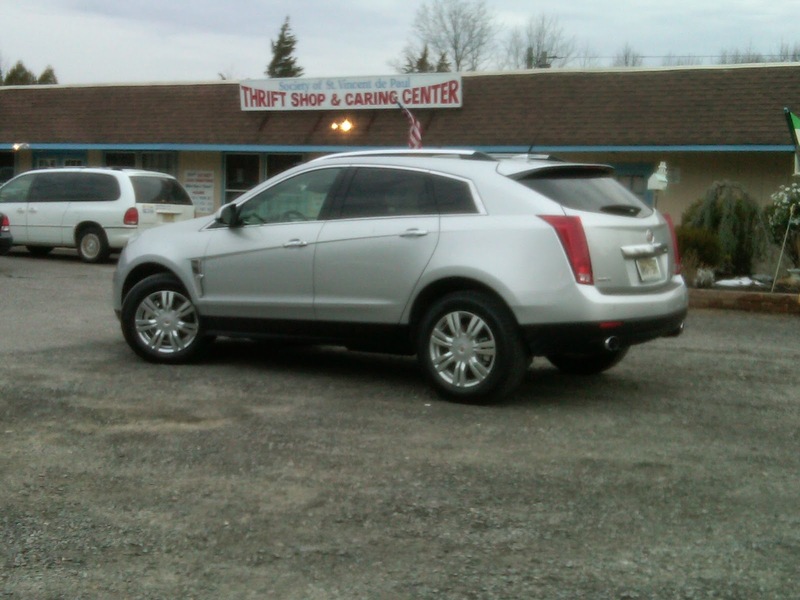 How about hitting the shops in this sweet Cadillac SRX SUV? 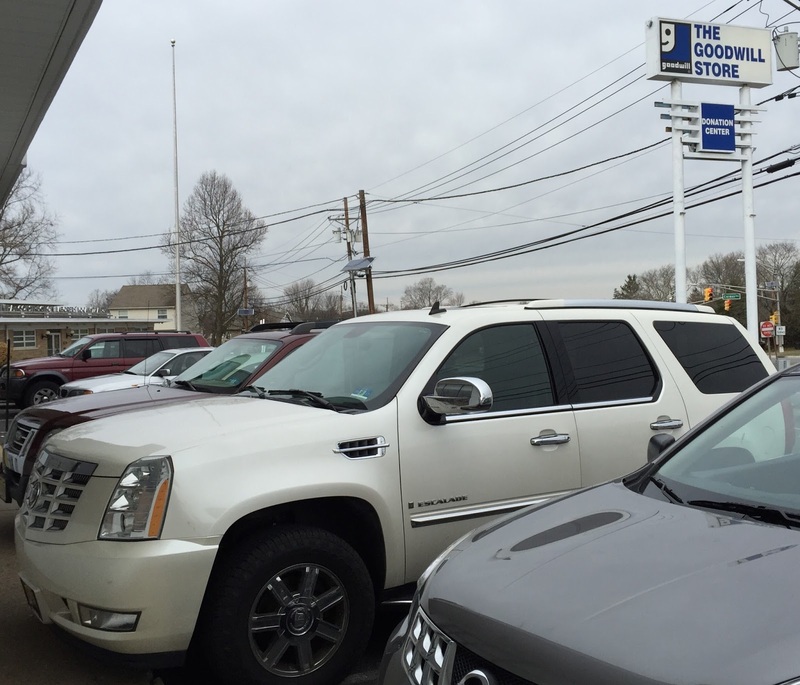 You can buy new at $45 grand or "settle" for an off-lease model at only $30 thousand. Either way, you'll be looking good at the thrift shop! 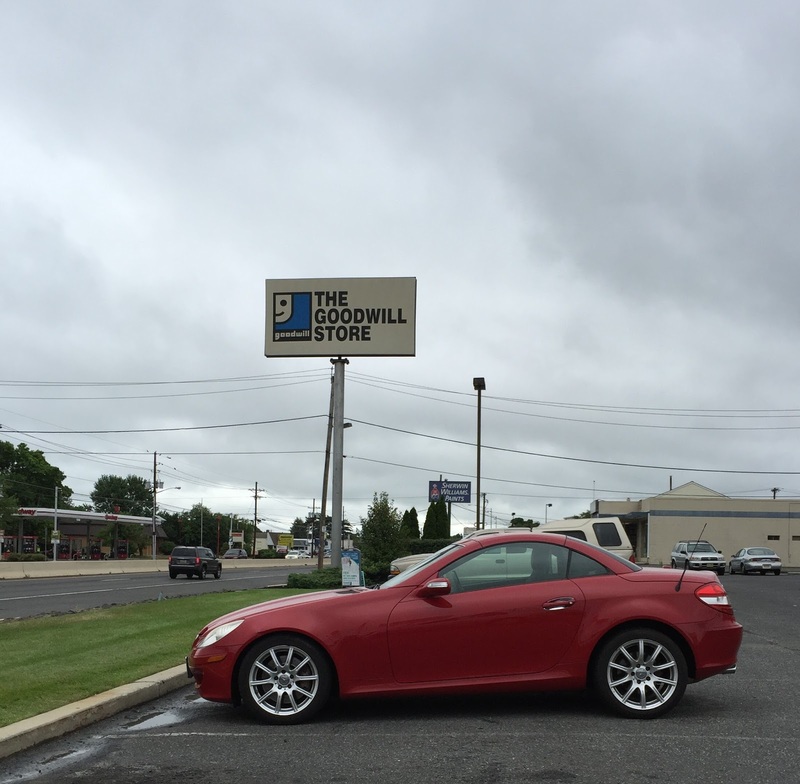 Here's an awesome looking Mercedes Benz convertible coupe parked in it's own personal parking spot right under the Goodwill sign. I guess the owner didn't want anyone throwing their car door in the side of his little sports car. I once saw a Range Rover at one of our local Goodwills. Some people shop there to find unique items. Not sure if you know who Dave Ramsey is, but he's mentioned a few times that his son shops there because he can find cool clothes that no one else has. 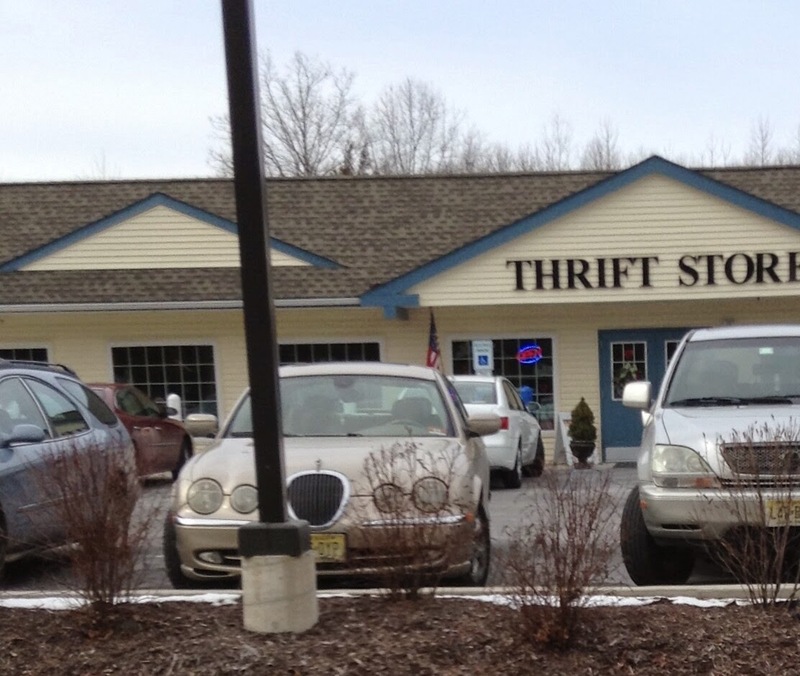 I have spotted a Range Rover yet at my thrift stores. I agree, some folks are there to do "antiquing", ect. I do believe though that there are those affluent folks who are just extremely thrifty. 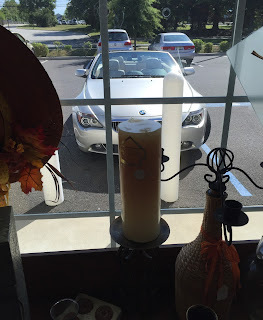 Funniest thing is to see a fancy BMW parked right next to a broken down Honda or Chevy in a thrift store parking lot.